Understanding a patient’s answers provides guidance for what really matters to the person and how to move forward with a valuable treatment plan. Many of these questions are used by palliative care and hospice providers for people facing the very end of life. Dr. Gawande lobbies for asking these questions earlier in the healthcare process as a positive contribution toward patient care. A gifted storyteller, Dr. Gawande introduces readers to people in difficult, critical situations and invites us into the deeply personal discussions of navigating the road ahead. Through these real experiences, he shows us how we have the opportunity to refashion our institutions, our culture, and our conversations in ways that transform the possibilities for the last chapters of people’s lives. 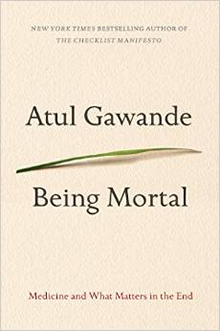 Atul Gawande does not write from a Christian world view, but we are recommending the book for nurses and other healthcare practitioners because of his practical and affirmative support of the dignity of human life and respect for each person in making decisions about medical treatment. This book is on my short list.